DAF EURO 6 AdBlue Emulator (EAS 3) is compatible with EURO 6 DAF trucks. This installation manual describes the whole process of AdBlue Emulator device installation on compatible DAF EURO 6 vehicles. We highly recommend you to delete all DTC (Diagnostic Trouble Codes) errors from OBD (On-Board Diagnostics) system. The best option is to use DAF VCI 560 diagnostic scanner. Also, it is recommended to check OBD system after installation of AdBlue Emulator module because there might be errors related to installation procedures. Before we proceed to the installation process, we need to remind you that DAF EURO 6 AdBlue Emulator (EAS 3) needs preparation for installation. We need to program it with the VIN (Vehicle Identification Code) of your truck. Emulators without VIN data do not work at all. Programming VIN to the DAF emulator is critical! Attention! Electronics of EAS must be functioning. Communicating with the engine ECU is necessary! The first step is to locate metal plate near the rear muffler that covers EAS ECU. Unplug the NOx sensor. Connect NOx sensor connector to corresponding DAF EURO 6 AdBlue Emulator (EAS 3) connector. Next step is to connect another emulator plug to the socket on the truck where NOx sensor was initially connected before. Now you need to detach plug B (the smaller one) on the EAS ECU. Find the thin red wire (PIN 41 on the plug) and cut it to get two sides of wire to connect. Now you have to sides of the wire. One goes to the EAS ECU (connect it to the yellow-green wire of the emulator), and another goes to the SCR system (connect it to the red wire of the emulator). Now you need to connect plug B back to the EAS ECU. The next step is to locate fuses F22 (E497, 15A) and E24 (E706, 5A). 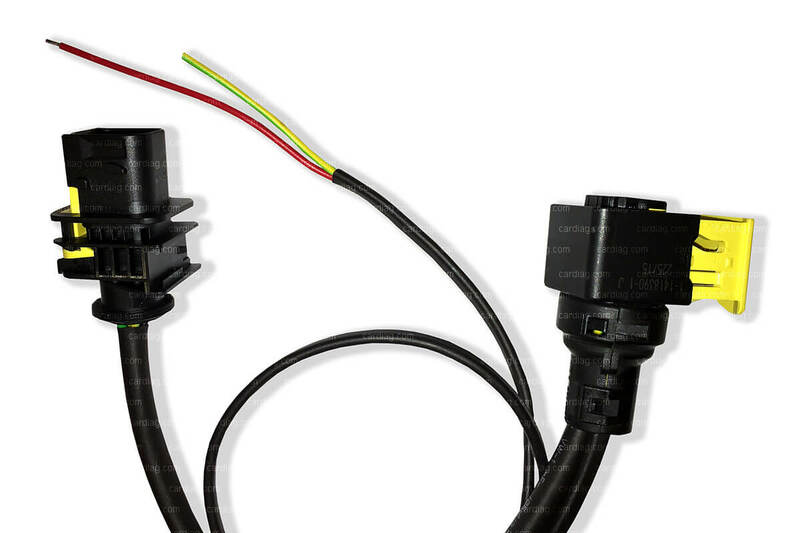 At this point fuse E24 (E706, 5A) is used by DAF EURO 6 AdBlue Emulator (EAS 3) and it means that you can disable AdBlue emulator by removing this fuse. When this fuse removed and fuse F22 installed, SCR system will work normally. To use AdBlue emulator remove fuse F22 (E497, 15A) and leave E24 (E706, 5A) installed. Attention! Do not use both fuses at once. Use only one of them depending on your need. Both fuses installed or none of them – faulty system, possible damage to the EAS ECU or emulator module. Reminder! Delete all DTC errors from the OBD system. AdBlue Emulator EURO 6 NOx installation manual for DAF trucks was last modified: May 3rd, 2018 by Cardiag Inc.